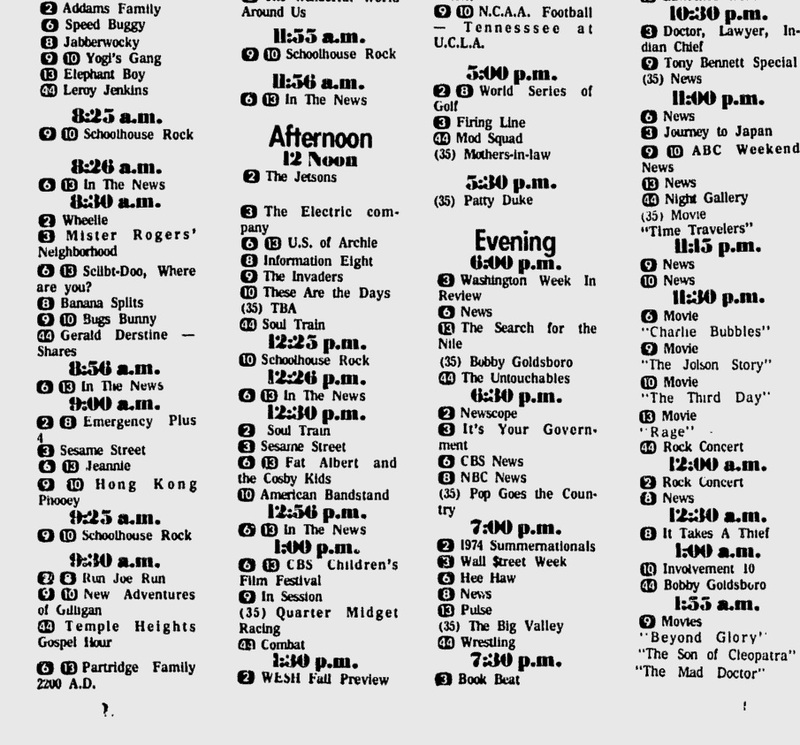 Highlights from the week of October 28 through November 3, 1978, via Garage Sale Finds, where you can see a lot more. 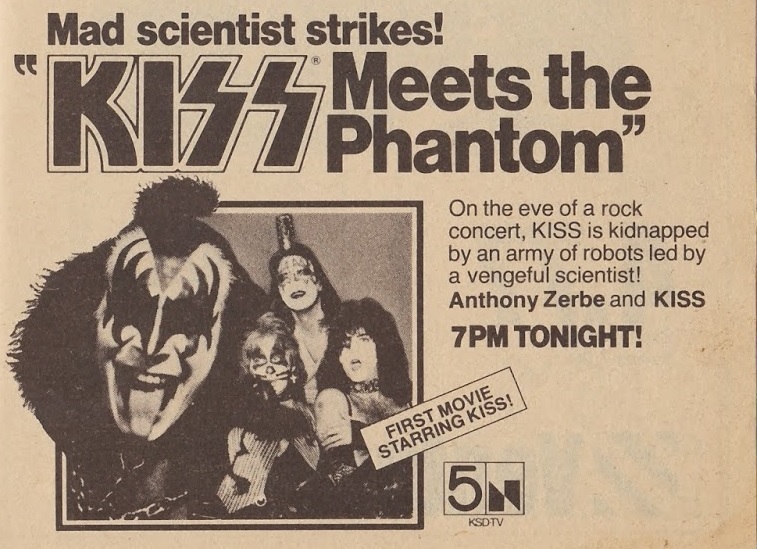 Kiss Meets the Phantom is actually Kiss Meets the Phantom of the Park, and it’s one of the more notorious TV productions of the 1970s. Produced by Hanna-Barbera, it plays like a demented, less well-acted, live action Scooby-Doo episode with a hard rocking soundtrack, and for all those reasons is a must watch. A slightly different, slightly more coherent version titled Attack of the Phantoms was released in theaters outside the U.S. in 1979, and you can watch it (as of now) here. 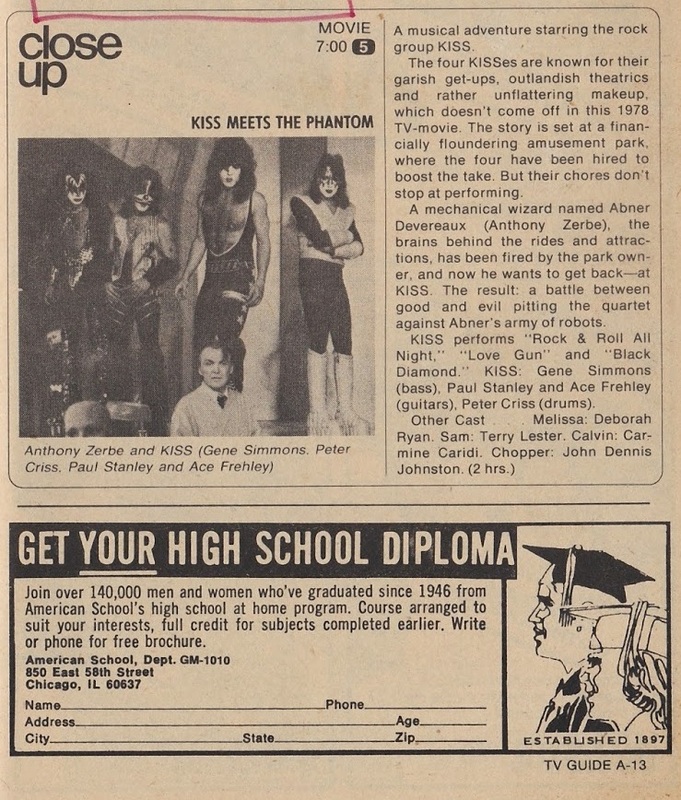 Incidentally, if there’s a place to put your “Get Your High School Diploma” ad, it’s underneath a Kiss promo. I talk about Devil Dog: Hound of Hell here. Stranger in Our House is a fun chiller directed by Wes Craven about a satanic, teenage witch who infiltrates and terrorizes a suburban family, with Linda Blair playing the good girl. 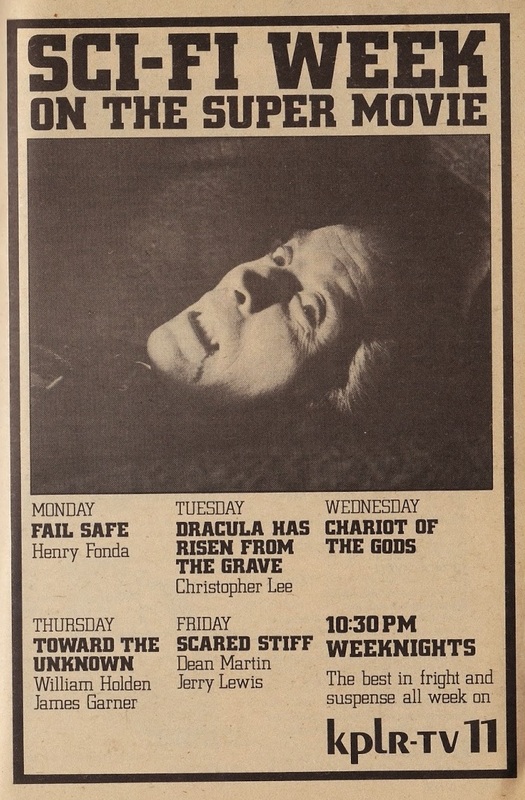 (1981’s Midnight Offerings was another TV movie with the same theme). 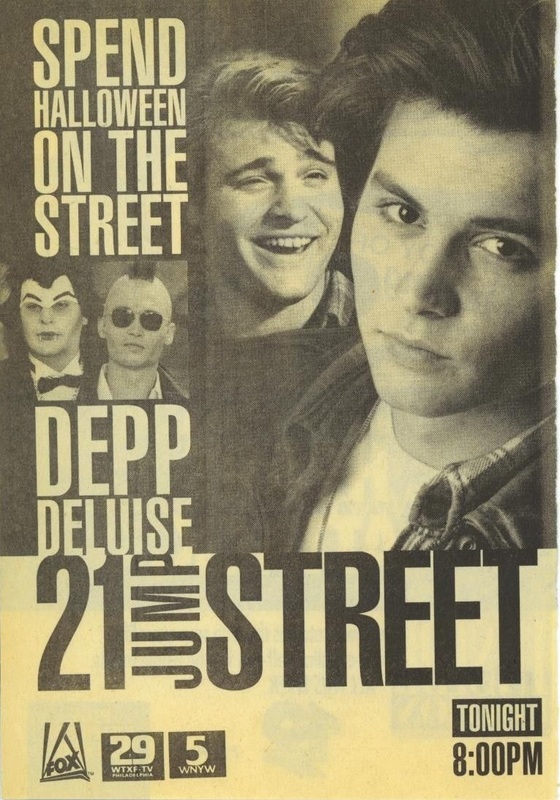 Both films aired on Halloween night. 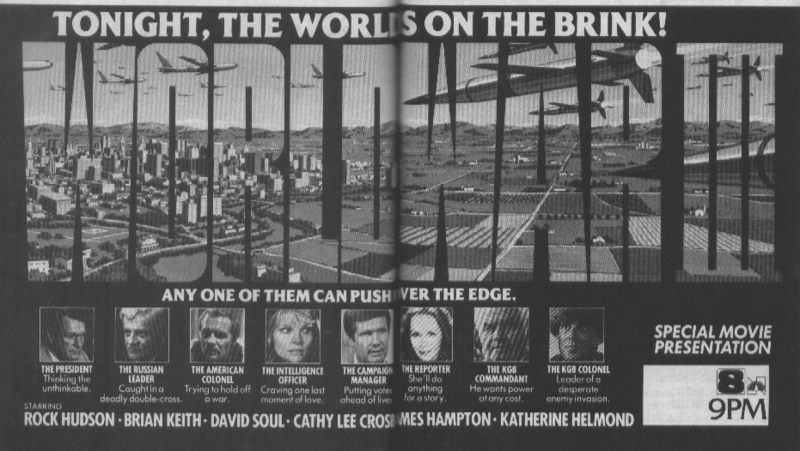 I only vaguely recall this two-part miniseries that focuses on the lead-up to a nuclear war through the eyes of opposing diplomats and military leaders. Not nearly as effective or frightening as The Day After, but it did premier a year earlier and was generally well received. Rock Hudson really hams it up as the POTUS, and Cathy Lee Crosby’s character is, apparently, “craving one last moment of love.” Trailer is below. Every genre movie of the ’70s starring Doug McClure (The Land That Time Forgot, The People That Time Forgot) is a classic, including this one. If you don’t believe me, read Kindertrauma’s glowing review. Unkle Lancifer calls it “the main inspiration and catalyst for this site (and perhaps my love of horror)!” As of now, you can watch it here. Satan’s Triangle is the first movie based on and explicitly referencing the Bermuda Triangle, following Charles Berlitz’s lurid 1974 bestseller on the subject. Another TV movie, Beyond the Bermuda Triangle, starring Fred MacMurray and Donna Mills, would follow later that year. 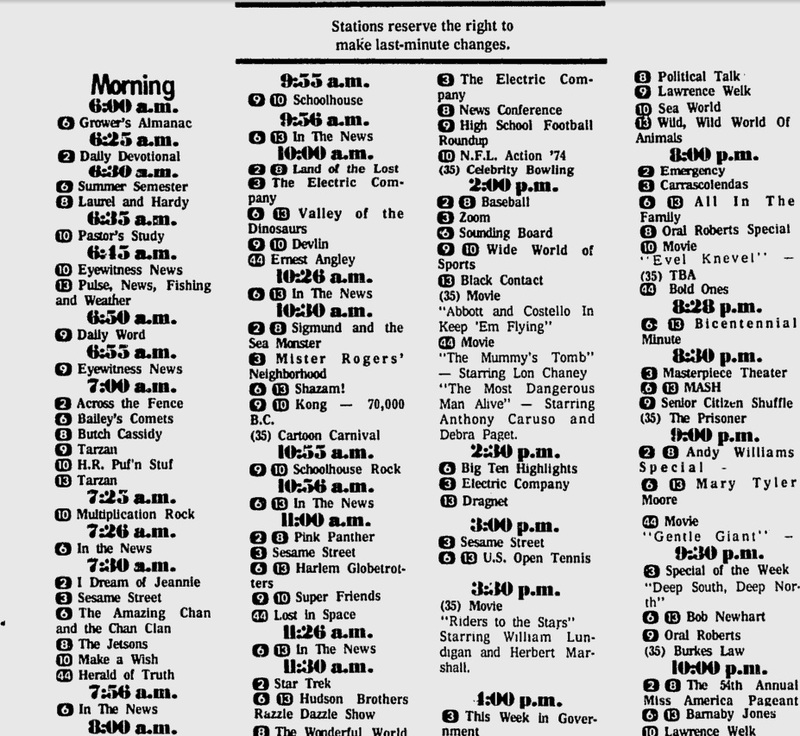 The Bermuda Depths (1978) is another popular TV movie on the same theme (thanks for the reminder, Christopher S.). 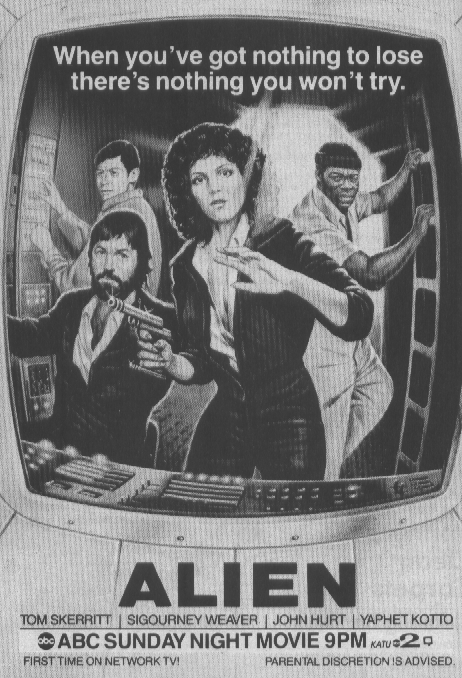 Not only are there some big names in the cast, but Amy Heckerling produced and directed the seven-episode series, essentially an open-ended remake that didn’t get picked up. I just watched the pilot on YouTube and was entertained, mostly by the San Fernando Valley locations, the fashions, and the dialogue (then 19-year-old Moon Zappa consulted on high school mores and slang). Claudia Wells (Marty’s girlfriend in Back to the Future) played Linda, the role played by goddess Phoebe Cates in the original movie; Courtney Thorne-Smith played Stacey (Jennifer Jason Leigh in the original); Dean Cameron (Summer School) played Spicoli (! ); Patrick Dempsey played Mike (Robert Romanus in the original); Vincent Schiavelli and Ray Walston reprised their roles as Mr. Vargas and Mr. Hand, respectively; and Wallace Langham, who I’ll always remember as Larry’s writer on The Larry Sanders Show, played Ratner. 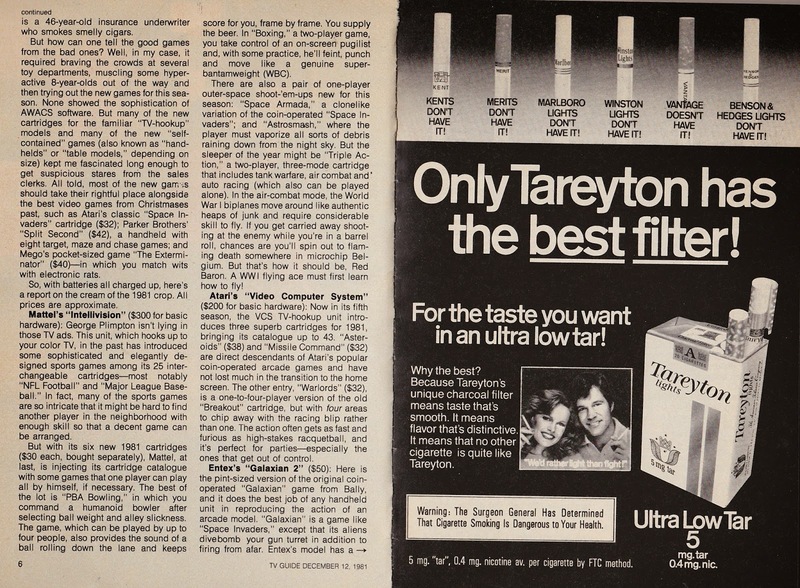 As critics at the time noted, the necessarily sanitized version of the film left young audiences feeling robbed, especially in the wake of the TV-safe but right-on Square Pegs (1982-1983). 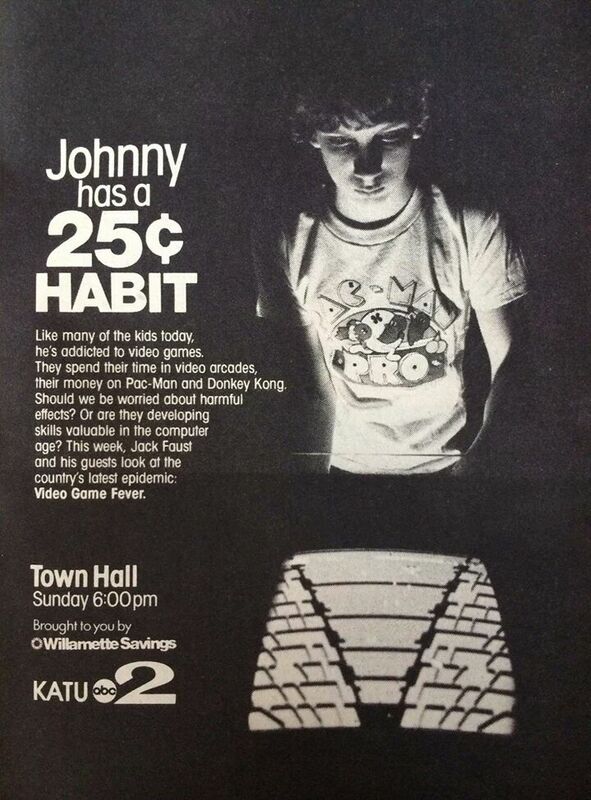 There’s nothing interesting in the pilot script, except for a neat segment where Spicoli gives a presentation about what makes his 13-year-old brother a “skate rat,” pointing out the bleached bangs (I had them in ’86), untied high tops (ditto), long skate shirt, etc. Little brother is played by Jason Hervey (Wayne in The Wonder Years), who steals the scene and even does a Boneless off the desk. The catchy opening theme was written by Danny Elfman and played by Oingo Boingo. Elfman grew up where I did, California’s San Gabriel Valley, and Boingo was constantly playing local shows in the ’80s, even after they hit it big with Dead Man’s Party (1985). 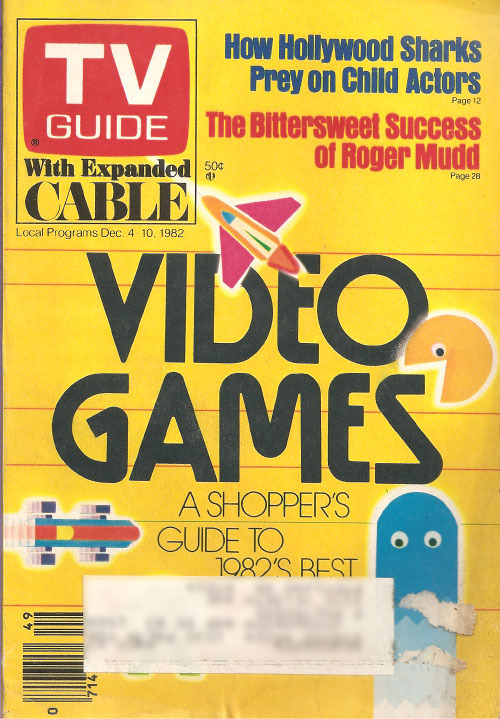 Last year I posted TV Guide’s “Best Video Games of 1982,” by Len Albin. Thanks to Tom at Garage Sale Finds, we now have the 1981 edition by the same author. 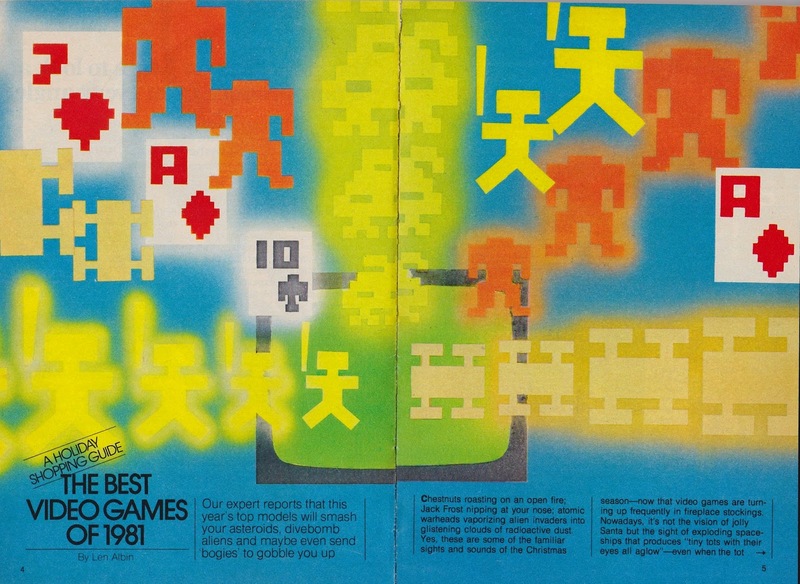 Lots of handhelds listed here, including Galaxian 2, a great game from Entex that allows one person or head-to-head play, with one of the players controlling the dive-bombing aliens. 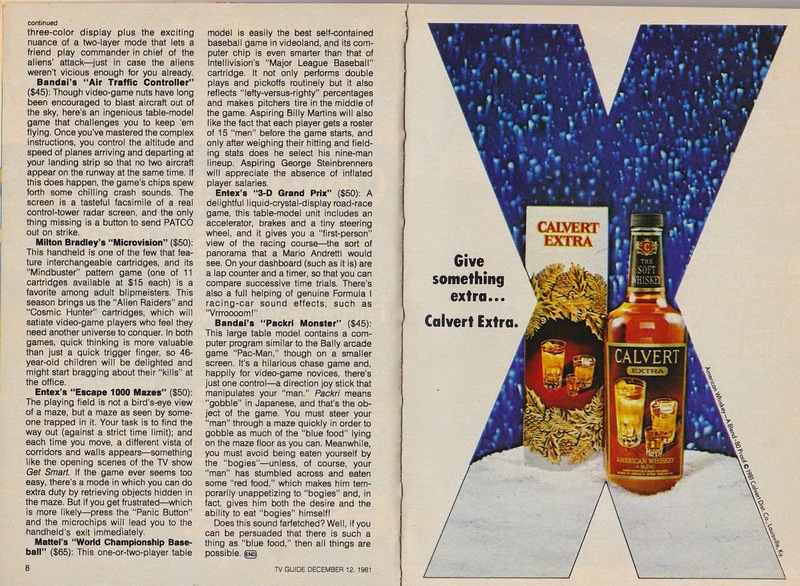 Also check out the hilarious 1974 Avon Catalog Tom found, from which you can order a Thirteen Original Colonies Pillow ($8.99), or Loop-A-Moose Game and Soap ($2.99). Johnny is dressed up as Travis Bickle, naturally. The episode is “Old Haunts in a New Age,” from October 30, 1989. As of now, you can watch it here. 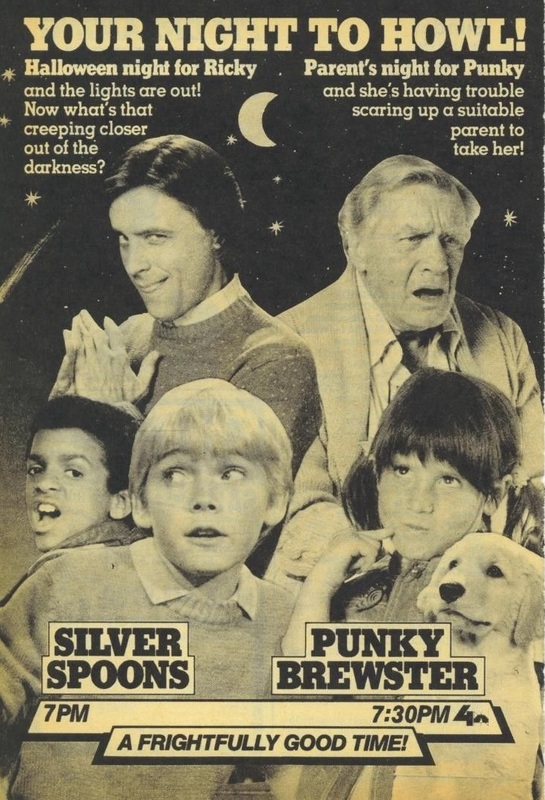 The Silver Spoons episode is called “A Dark and Stormy Night.” You can watch it here. Synopsis: The power goes out as the boys are watching a horror movie, and dad chides them for depending on TV when they should be using their imagination. So they gather around a candelabra and play “pass the ghost story”—which, of course, the rest of us unimaginatively watch on TV. 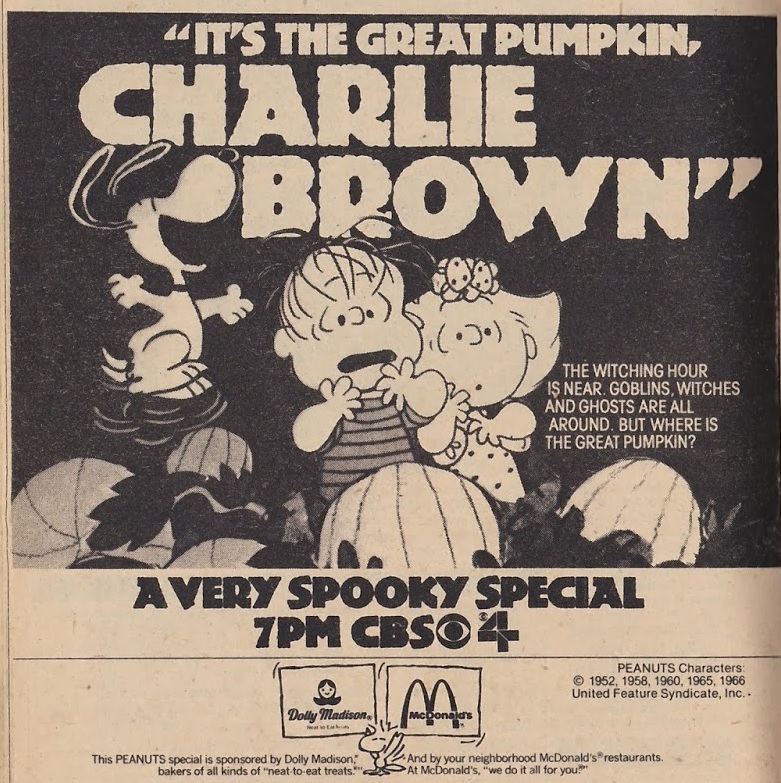 The Punky episode has nothing to do with Halloween, so I shall ignore it. 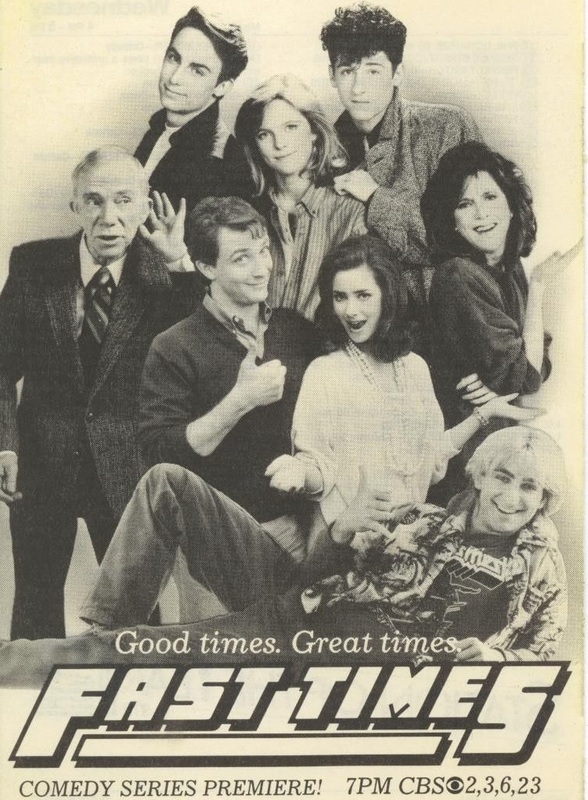 Both shows premiered on October 28, 1984.